Bridging a dining gap between the local and homespun, with the highbrow and forward, is no simple feat for a culinary festival with freshman status. And, despite any initial hesitations, the newly minted Devoured Culinary Classic this past weekend proved just that — an ability to be everything to nearly every mindset. 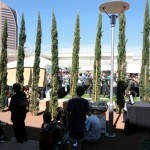 Devoured is the new food festival to be held each spring at the Phoenix Art Museum. Though technically it was a brand-new event altogether, Devoured unofficially replaces the previous event held annually at the Midtown museum, West of Western. To say that casual comparisons between the two illustrations of sophisticated, urban food festivals by attuned locals wouldn’t happen, would frankly be naïve. So, thankfully, by all respectable accounts (and the palpable vibe of the crowds on both days), Devoured not only one-upped West of Western, but it also was an honest improvement. Orchestrated in large part by local advocacy and growing nonprofit Local First Arizona and its supreme leader, Kimber Lanning, Devoured encouraged an agenda-driven undercurrent of all things local and “independently edible.” Though there were definite exceptions throughout, Devoured was also intended to be a weighted showcase of participants located within the loose radius of Central Phoenix — a tip on the local dining scale that usually leans Scottsdale. To those living outside the urban bubble of Central Phoenix traveling inward to attend Devoured this past weekend, it was representation done well. With a range of interesting guest speakers (former New York Times and Wall Street Journal restaurant critic Raymond Sokolov was a particular big-ticket draw) and cooking demonstrations, as well as over 70 local restaurants and 25 wineries (mostly Arizona bred) taking part, Devoured’s inauguration was a near perfect food-themed storm that would respectfully cater to both food snobs and casual eaters alike. Though worth the ticket price for both Saturday and Sunday, if one day had to champion the other for ultimate food hierarchy, the latter, Sunday, would have to take the rank. 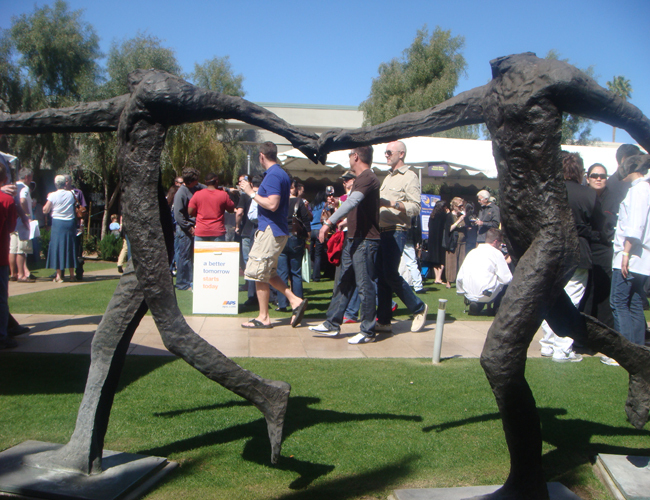 Participating restaurants and chefs jockeyed not only for prime grassy real estate in the Phoenix Art Museum’s beautifully landscaped and spacious sculpture garden, but also for prime scheduling. Sunday unofficially became a magnate for some of the most sought-after eateries in town, and, for the headlining chefs, the most overt flashes of showmanship and craft, as well. Some of Saturday’s highlights included an exceptional (as expected) charcuterie and cheese selection from Uptown’s Petit Fromage; a standout tuna tartare from the Phoenician’s J&G Steakhouse (one of the best such examples of tartare, of many similar, all weekend), served tightly atop avocado and a bright ginger broth; and Christopher’s Crush‘s other-worldly gâteau Marjolaine, a decadent and laborious pressed cake created with, among many other things, layers of almond meringue cake, separated by intermixing levels of chocolate, coffee and vanilla flavored creams. Gallo Blanco Café’s carne asada tacos and Hana Japanese Eatery’s waloo (think Hawaiian butterfish) tataki were both equally confident but simple pleasers. Sunday brought even more standouts. 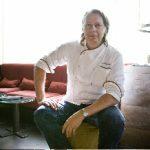 Former Cowboy Ciao chef Bernie Kantak helmed a booth representing not a specific restaurant, but his own creative, skilled abilities with curried, smoked shrimp and coconut. Shrimp paella from Lola Tapas was another immediate, well-executed sell. Nationally decorated restaurant Kai’s breadth of offerings made an intimidating impression with wild goat machaca and fry bread, seared rib-eye slices over a pineapple-avocado quinoa and two playful (and very popular) additions to their otherwise serious buffet — housemade, decidedly elevated versions of Ding Dong desert cakes and icy, citrus-bright hibiscus push-up pops. 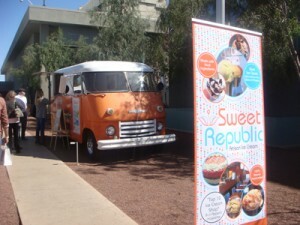 Sweet Republic, with its locally iconic, retro orange Chevy van parked in full view, served an array of ice cream flavors both seen and new — think flavors like bacon, salted butter caramel and white truffle. 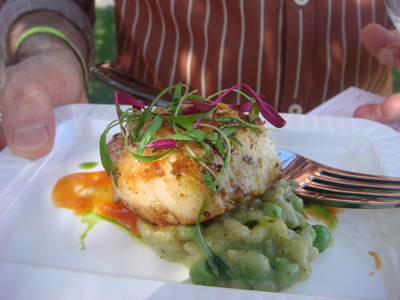 Different Pointe of View (at Pointe Hilton Tapatio Cliffs Resort) served a near-unanimous crowd favorite: seared, cupcake-sized diver scallops with a creamy, emerald English pea risotto. Honey Moon Sweets‘ collection of perfectly executed dollhouse desserts earned definite points for yum factor (let alone for presentation) with jewel-sized chocolate almond cups, tarragon and strawberry shortcake cookies and a near effervescent blackberry purée folded with homemade whipped cream and garnished with shavings of pistachio. Not to be outdone, easily maintaining one of the festival’s consistently lengthiest lines of hungry visitors, Old Town Scottsdale’s FnB restaurant was on hand with some premium miniature meatballs molded from Arizona-bred beef, as well as its popular shaved fennel salad and a thick butterscotch pudding for a welcomed sugary finish. Holding a double-day presence, Barrio Café was on hand with its drool-inducing cochinita pibil (slow roasted, citrus marinated pork), crowd-pleasing guacamole and on Sunday only, served its infamous mole. Besides a couple of liquor outposts and some tasty local brews from SanTan Brewing Company, the majority of alcohol consumption at Devoured belonged to wine. And, with the exception of a few participants, nearly all wineries present were Arizona anchored — another admirable trait of Devoured — like Pillsbury Wine Company, Page Springs Cellars and Arizona Stronghold, among several others. 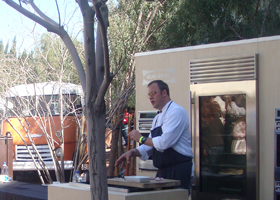 Cooking demonstrations were also popular at Devoured on both days, with acclaimed chefs like Christopher Gross, Aaron May (Over Easy, The Lodge, Mabel’s on Main), Matt Carter (Nine|05, Zinc Bistro, The Misson), James Porter (Petite Maison), among several others, drawing large audiences. 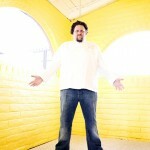 An unofficial climax occurred during Sunday’s few remaining hours when Caffe Boa’s Payton Curry carried a whole pig (head, hooves and all) over his shoulder like a sack of potatoes to the demonstration area, where he cheekily butchered the carcass in front of a highly entertained audience, readying it for preparation and samples. Showmanship at its finest. 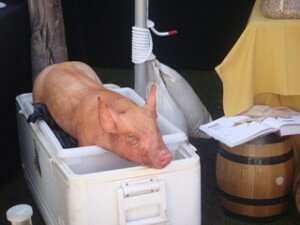 There were many, many other participating restaurants, chefs and wineries not mentioned that served great products. The entire crowd was food focused and full of positive, respectful energy. At any given time, circulating eaters could witness firsthand notable local restaurant critics, restaurateurs, off-duty chefs, winemakers, bloggers and food-focused tweeps intermingling, gushing about what they tasted with great energy. Devoured was easily a success, and this new annual food fête more than delivered on its intended angle that independent and local should always be a diner’s prerogative when out to patronize. Phoenix should be proud — the talent is here, the ingredients are being grown here and finally it seems, the enthusiasm to support it all is here as well. I’m sure each of the modern, talented and creative chefs could also do wonderful things with food that is not animal-based. That would be impressive.